A Boeing P-8A Poseidon multi-mission maritime patrol aircraft of the RAAF. Photo c/o RAAF. 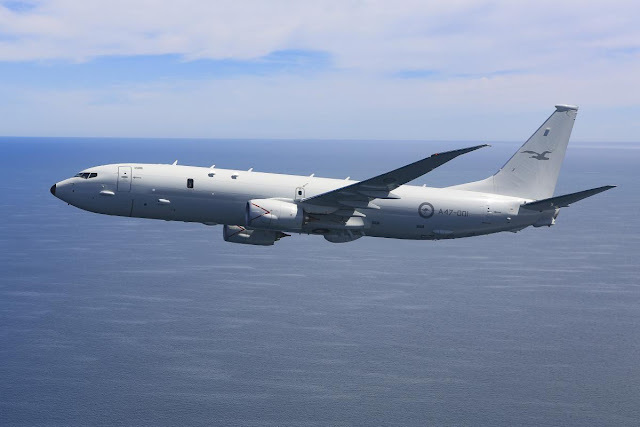 The Royal Australian Air Force (RAAF) received its 8th Boeing P-8A Poseidon multi-mission maritime patrol aircraft in the US, boosting the service's maritime patrol, surveillance, and anti-submarine warfare capabilities further. The aircraft is currently undergoing verification and validation flying in the US, and will be brought home to Australia by mid-June 2019. The Boeing P-8 Poseidon replaces the ageing fleet of Lockheed AP-3C Orion turboprop maritime patrol aircraft. Up to 15 aircraft are planned. The fleet are based in RAAF Base Edinburgh in South Australia, together with other surveillance and intelligence support aircraft and unmanned aerial vehicles of the RAAF.